During the reunion for the 71st anniversary of the Battle of Iwo Jima, I had the chance to meet Norman L. Baker. Norm served in the Sea Bees (Naval Construction Battalions) during World War II, but Norm wasn’t a skilled laborer like most of the men in the Sea Bees. He was just a young guy and assigned as part of the security detachment for Headquarters Company, 62nd Naval Construction Battalion. The battalion was attached to the Fifth Amphibious Corps, so he landed on Iwo Jima to provide security for the engineers and tradesmen. Unlike Marines in the line, this ended up allowing him some opportunities for ‘wandering’. He told me of his fascination with airplanes, especially fighter planes. As soon as the airfields were “secured” enough that they could risk basing planes there, they did. So, Norm had a chance to get up close and personal with the planes. He related that one time, a fighter plane taxied off the runway and the pilot hopped down when he was nearby. The pilot was a young red-headed fellow, probably right about Norm’s age and was thrilled to be able to show him everything there was to know about the plane. It’s a thrill he still remembers. When he went back a few days later to see if he could find his new friend, Norm was told he wasn’t there anymore. One hopes that the pilot was merely injured or reassigned, but I can’t help but imagine that he was among the thousands who paid with their lives for the Marines to secure Iwo Jima. Due to the proximity of the National Museum of the Marine Corps and the high profile of the event, several docents from the museum were in attendance and brought along some artifacts. When Norm was on Iwo Jima, he carried a Thompson Submachine Gun, as he is here in the photo. It was just happenstance that I saw him drift over and ask the docents if he could hold the gun. So, we all got some nice shots of Norm posing in front of the map they’d brought from the museum. Attending these reunions is always among the highlights of my year because there’s such an opportunity to meet and mingle with some wonderful veterans, their families, historians and Marines of every era. Importantly, never forget the Sea Bees! Just wanted to get the word out that the 2014 reunion of the Iwo Jima Association of America will be held 13-16 February at the Sheraton Pentagon City, where we hold the Operation Dragoon and Colmar Pocket events. The strong turnout from active duty Marines always makes for a robust event and there were also many WWII veterans in attendance last year (fewer every year, though). I was able to get my photo with GEN James N. Mattis after his luncheon speech and truly enjoyed dancing to our favorite swing band, Radio King Orchestra at the banquet. It’s a marvelous event and I suggest that if nothing else, you spend $15 for the general registration to meet some of the veterans and enjoy the Saturday symposium (lunch is extra, but will include another excellent speaker and the banquet is extra, but includes not just a speaker, but plenty of dancing time as well!) The schedule can be found online and registration via Armed Forces Reunions is also available online. I’ll be present for the whole kit & kaboodle, since touring the Marine Corps Museum and visiting the Memorial with veterans of Iwo Jima is simply priceless. At Saturday’s luncheon, General James Mattis spoke to the veterans of Iwo Jima, their families, and a number of active duty Marines and their families. I was lucky enough to attend the event and have since joined the Iwo Jima Alumni Association as an associate member. Marines take pride in their Corps. The General related that John Glenn once said that his wingman, Ted Williams, was asked about the best team he’d ever been on and Williams responded “the Marines”. 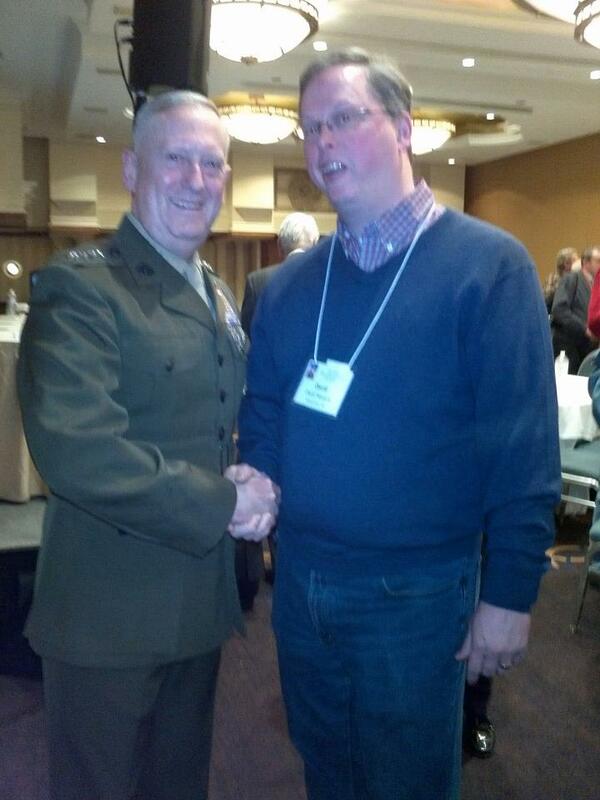 When I got to the front of the line for photos with the General, I was completely disarmed when he called me by name. As a Navy Chief once told a just-graduated Navy ensign at the Academy, “Refer to your sailors by name, they’ll love it and they’ll forget it’s written on their chests.” Nonetheless, it was quite an honor for me. The banquet on Saturday evening was also wonderful, with Commandant of the Marine Corps General James Amos as the guest of honor. The additional treat of having Radio King Orchestra play after dinner. Melissa and I love swing dancing and RKO had played at our wedding, so it was a reunion of sorts for us as well. 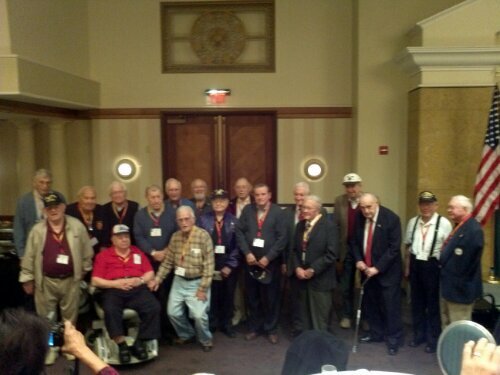 I’ve had the privilege of joining the veterans of Iwo Jima at the reunion at the Sheraton Pentagon City where we hold our Dragoon and Colmar events. It’s been a wonderful event and I expect to attend more than just the seminar next year.